Great read for family businesses and it is free this week. Written from decades of research and application by wealth transition and family business expert from Australia, David Werdiger, ‘Transition’ reaches out to family businesses torn by inner conflict, confusion and the raw possibility that their mini empire will be all but dead in another generation’s time. 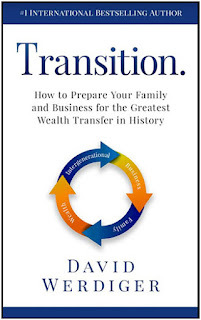 Using wisdom from his own boundless success and work as a consultant to thousands of family businesses, Werdiger offers entrepreneurs a bold opportunity to prepare for the greatest wealth transfer in history, by redefining how they look at and operate their business. From learning how to better communicate with the many generations who have input in their family business, to resolving conflict, re-establishing trust and calculating how much wealth should be left behind for future generations – this compelling volume is the only one of its kind on the market. David Werdiger is a #1 International Bestselling author, and the Founder and Chairman of Billing Bureau, one of the leading Australian Telecommunications Recurring Billing Software companies. He has been featured on ABC, NBC, CBS, FOX, The Wall St. Journal, USA Today and most recently he presented an ELI Talk titled “How to ‘Have’ Jewish Grandchildren.” As an in-demand speaker, David travels the world sharing his ideas about business strategies, philosophies on life, Jewish culture, and philanthropy. David has completed a Masters of Entrepreneurship and used his knowledge to expand several successful businesses in the Information Technology and Telecommunications industries. He currently mentors and advises family businesses, CEOs, and top-level entrepreneurs on how to successfully systemize their businesses so that they can increase revenue, scale, and even exit their business. David lives in Melbourne, Australia with his wife and five children.